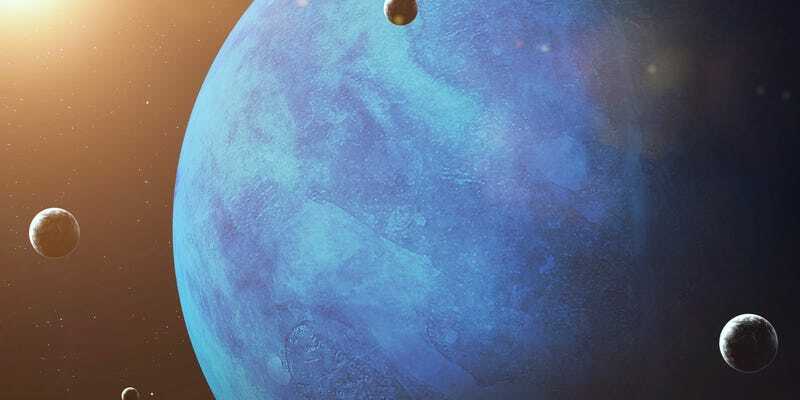 Neptune, the farthest named planet in our solar system (sorry Pluto), is unusual in a lot of ways. One rotation around the sun lasts about 165 Earth years, and each season is around 40 Earth years. Another noteworthy thing about the planet is its atmosphere, which has a fluctuating brightness. Scientists call this anomaly a “wobble,” which might be the most adorable name for atmospheric irregularities ever created. And researchers from Oxford University think they can explain that anomaly. As described in a paper in Nature Communications, the Oxford physicists looked at photometric data from Neptune’s atmosphere collected between 1972 and 2014. They found that the brightness, along with the strange weather phenomena, were due to its distance from the Sun, combined with the makeup of the atmosphere. Neptune receives 900 times less sunlight than Earth—and is a lot colder as a result—but that doesn’t mean the Sun can’t affect the atmosphere. The “wobbles” were found to coincide with the Sun’s 11-year activity cycle, meaning they could’ve been influenced by the small changes in sunlight, and by cosmic rays, which are also influenced by that cycle. In the past, scientists have debated which of these was the cause, but apparently, it’s a combination of both. “The ‘wobbles’ in Neptune’s cloudiness appeared to follow the Sun’s 11-year activity cycle, which could mean that they were influenced by small changes in sunlight. Another suggestion was that particles from outer space, called cosmic rays, which are also affected by the solar cycle, were changing the clouds. Using the different physics of the two mechanisms, we showed that the combined effect of the two ‘rival’ hypotheses explained the changes in cloudiness more successfully than each would do individually. The sunlight and the makeup of Neptune’s atmosphere also explains why the planet is blue. Neptune’s clouds are made up of substances such as helium and methane, which absorb most of the red light from the sun.